Scientists at Newcastle University are trying to help women who are at risk of passing on serious genetic disorders to have a healthy child. Last year the UK approved laws to permit the procedure, which involves using donor DNA from a second woman. The study in Nature found the technique will lead to normal pregnancies. The process, known as "early pronuclear transfer" involves removing the parents' key genetic material from an embryo within hours of fertilisation, leaving behind the woman's faulty mitochondria. The parental DNA, which contains all the key genes responsible for character and appearance, is then transferred into a donor woman's embryo, which has its nucleus removed but contains healthy mitochondria. Last year the UK became the first country to approve laws to permit the procedure. Prof Doug Turnbull, director of the Wellcome Trust Centre for Mitochondrial Disease at Newcastle University and a co-author of the study, said: "This study using normal human eggs is a major advance in our work towards preventing transmission of mitochondrial DNA disease." Prof Mary Herbert, also from the centre, added: "We are optimistic that the technique we have developed will offer affected women the possibility of reducing the risk of transmitting mitochondrial DNA to their children". 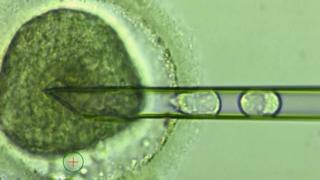 However, one in five of the stem cell lines created from the embryos showed an increase in carryover of defective DNA from the original embryo. Prof Turnbull said: "Our studies on stem cells does express a cautionary note that it might not be 100% efficient in preventing transmission, but for many women who carry these mutations the risk is far less than conceiving naturally." Mitochondria are tiny structures which sit outside the nucleus of the cell and convert food into useable energy. Genetic faults in the mitochondrial DNA mean the body has insufficient energy for key functions. This can cause a huge range of serious illnesses including muscle weakness, hearing loss and multiple organ failure. The structures are always passed on from mother to child and have their own small amount of DNA, but it does not affect appearance or personality. Clare Exton, aged 36, from south Derbyshire, who carries faulty mitochondria, is hopeful that the Newcastle team may be able to help her have a healthy baby. Her mother Norma had multiple health problems due to mitochondrial disease and died aged 58. Clare told me: "Mum got increasingly weaker over the years. She suffered epilepsy, deafness, heart and breathing problems and was very unsteady on her feet." Clare is partially deaf and wears hearing aids due to the faulty mitochondria she inherited. Her health is regularly monitored at the Centre for Mitochondrial Research in Newcastle. She said: "Everyone wants to have a healthy child, but how my mum suffered it makes me even more determined that any baby I have is not affected by this terrible disorder. "Knowing that the treatment would prevent the condition passing down future generations would be wonderful." Marie Austin is another patient at the Newcastle clinic. She is partially deaf due to due to faulty mitochondria and also suffers fatigue and mobility problems. Marie's son Adam died aged 12 from organ failure due to severe mitochondrial disease. Marie said: "Adam was a very positive smiling boy but he had very serious health problems from the aged of eight which got progressively worse. I have a daughter, Kaitlyn, who's 11 and she seems to be healthy for now. I really want her to benefit from this new treatment so in years to come she can have a child who is unaffected and I can have a healthy grandchild." The technique used in Newcastle would mean that the healthy mitochondria of a donor woman would combine with the DNA of the parents. It would result in babies with 0.1% of their DNA from the second woman, and this genetic material would pass down subsequent generations. The publication of the safety data was the last piece of scientific data required by the UK regulator, the Human Fertilisation and Embryology Authority (HFEA). An expert panel appointed by HFEA will now consider the results of the study. If it supports the findings then the team at Newcastle Fertility Centre will be able to apply for a licence to offer the procedure to women at high risk of passing on inherited mitochondrial diseases.